The month of organizing continues…or should we say it’s rolling right along?! For this month’s Michaels Makers challenge we decided to create a video showing you how to style a rolling cart in 3 different ways. 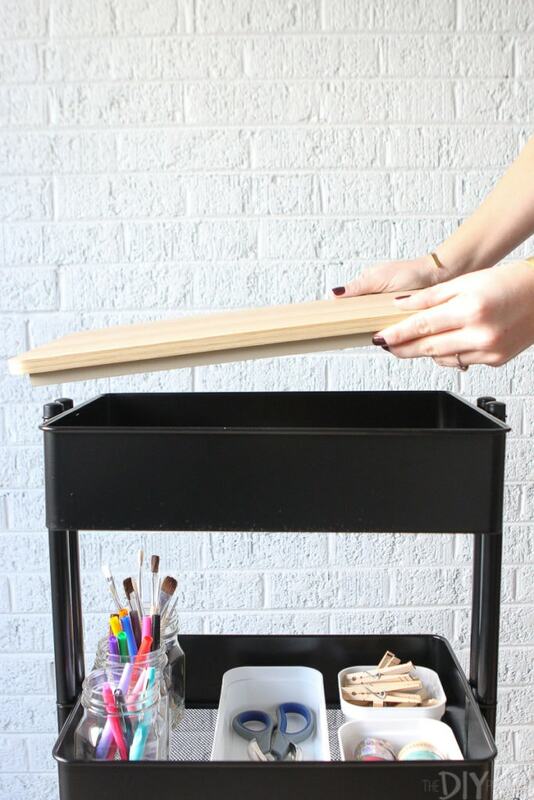 We’ve seen this rolling cart at Michaels for the past few years, yet we never scooped one up until this project. And we’re not sure why?! 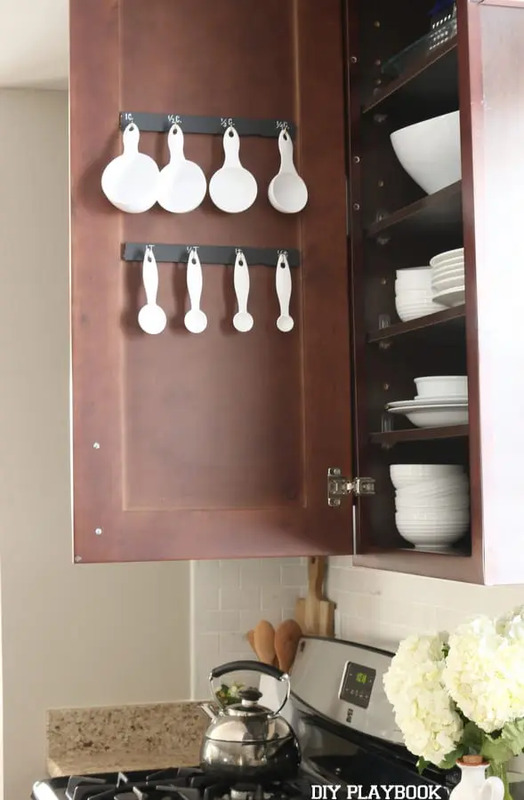 It comes in lots of colors, has 3 shelves for storage, and is incredibly versatile. How versatile you ask? 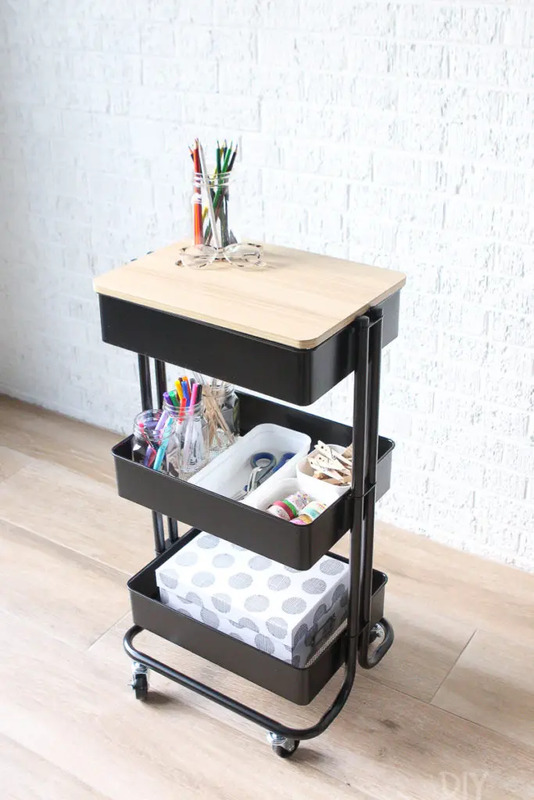 Well, we easily came up with three different ways you could use this little rolling cart, in 3 different areas of your home. 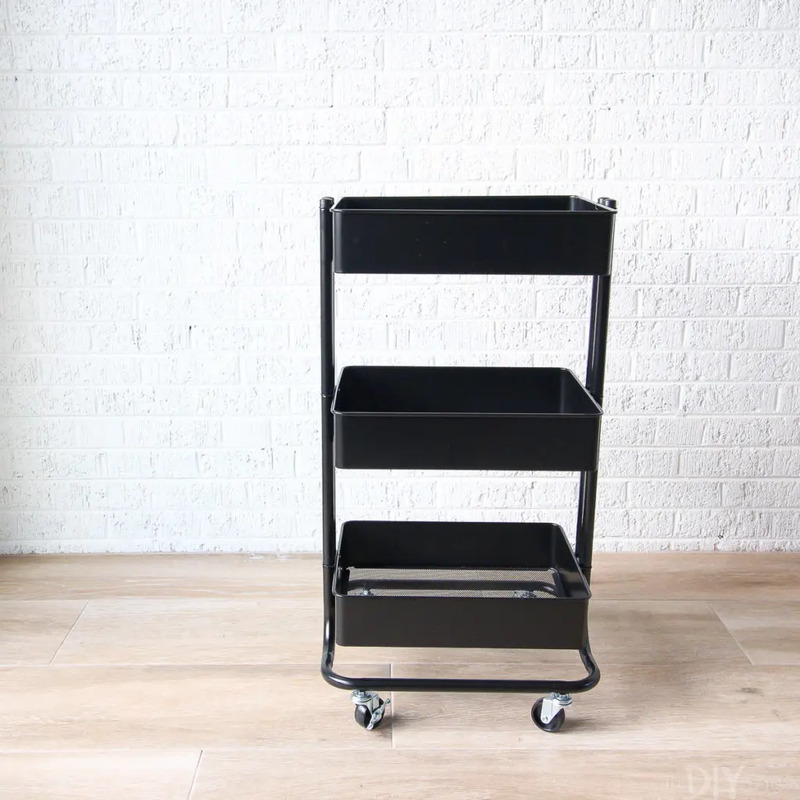 So let’s get right to the goods with our quick 1-minute video showing you this cart styled 3 different ways. 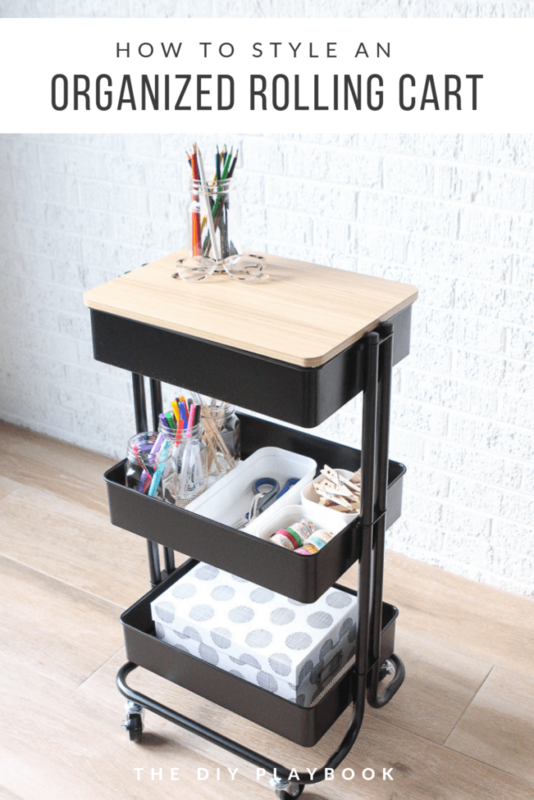 The first (and possibly most obvious) way to use this cart is to create a little creative station. 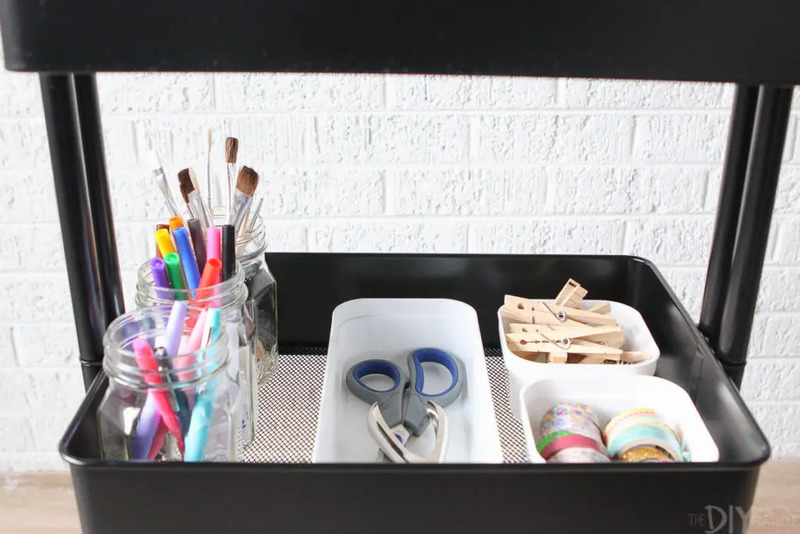 We love the idea of filling this little guy with colored pencils, markers, washi tape, and other craft supplies to create a mobile crafting station. 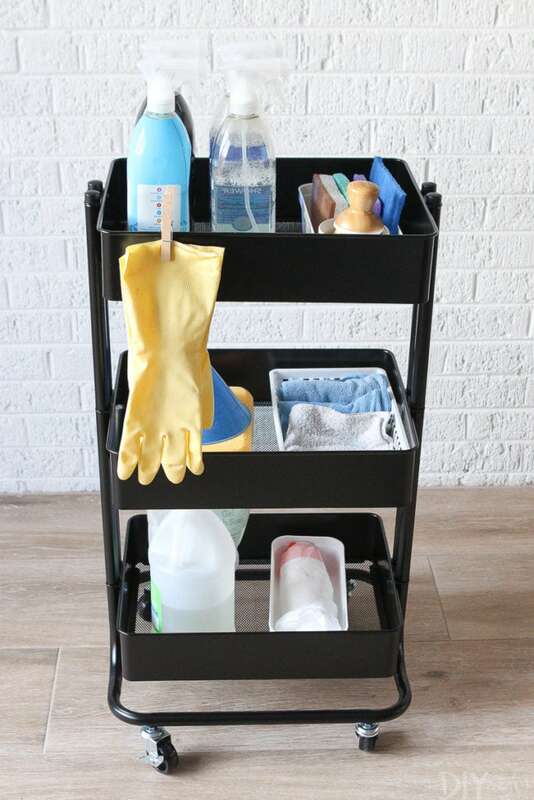 You can also buy this cart topper that fits on the top shelf of the rolling cart. If you have kids, this would be a good spot to tackle coloring or homework. 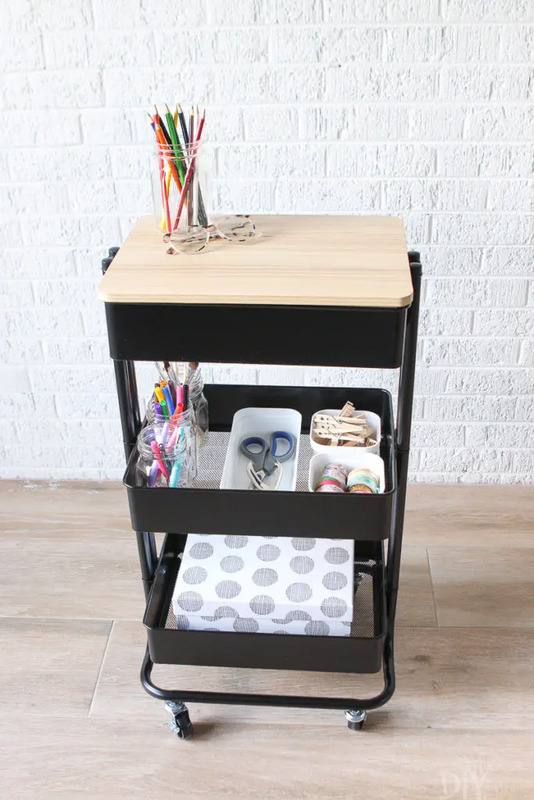 We love the idea of this cart in a playroom as you could roll it around depending on what project the kiddos might be working on. 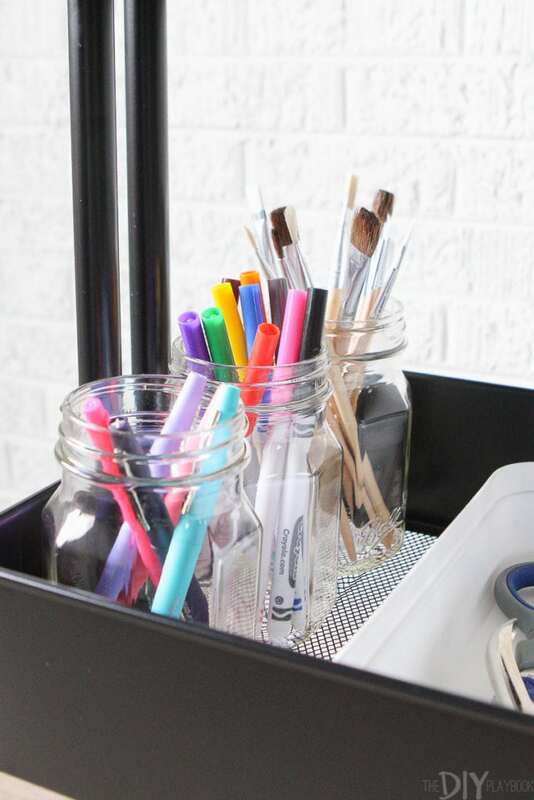 To corral some of the supplies, we used clear mason jars and small white bins. This keeps items separated and it makes things easier to find. On the bottom, you can add a cute printed box filled with various papers and other items to help your kiddos get creative! This rolling cart is also an ideal spot to corral all of your cleaning supplies. 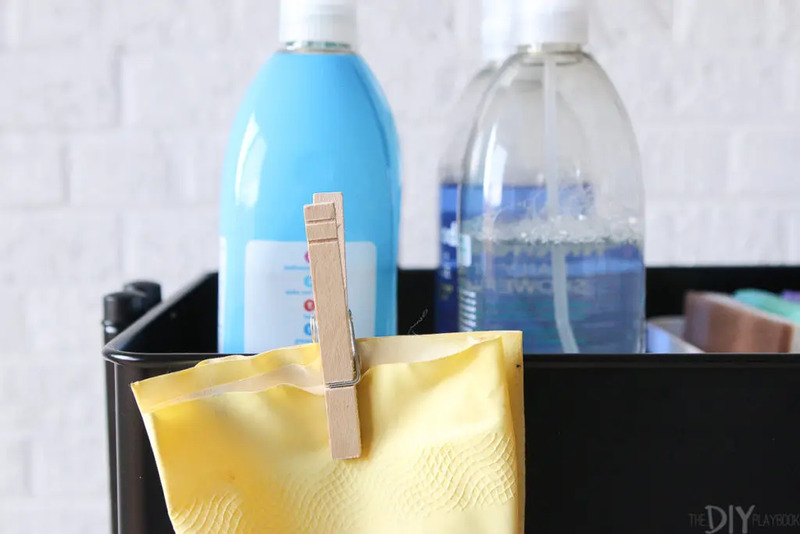 It can be a pain to lug all of the various bottles and rags around your house while cleaning. With this setup, you can roll all of the necessities with you from room to room! 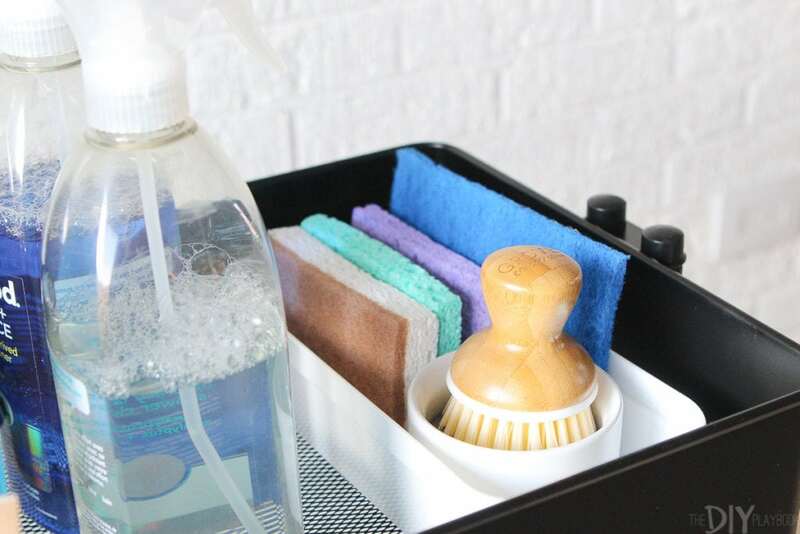 Up top, we organized sponges and brushes in that same small container and lined all of our spray bottles right next to them. You can also use a clothespin to clip gloves to the side of your cart. It’s a good way to make sure they dry out and don’t get mildewy between cleaning sessions. 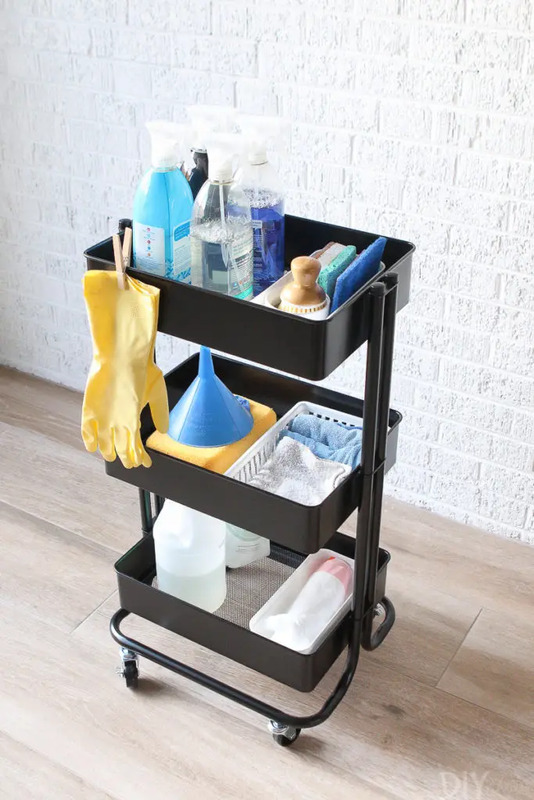 If you have an extra closet, laundry, or pantry space, you can roll this cart right in there and shut the door. 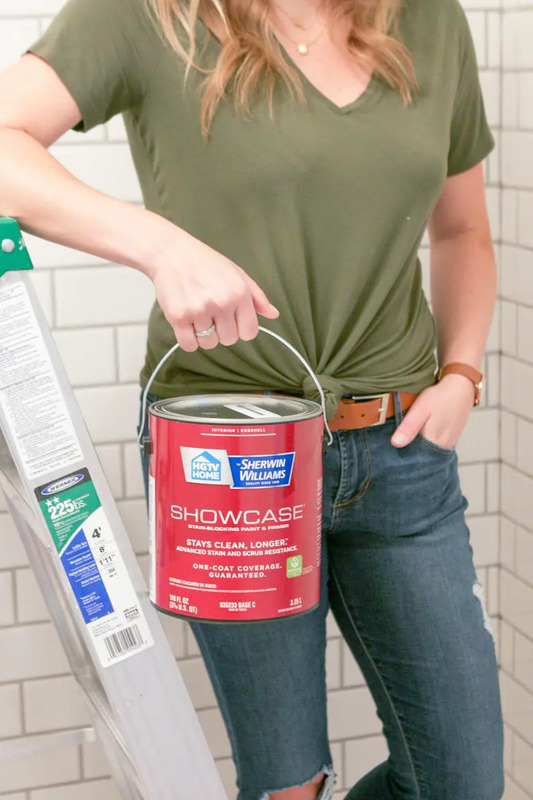 That way it’s out of sight, yet still handy when it’s time to get your home in tip-top shape! 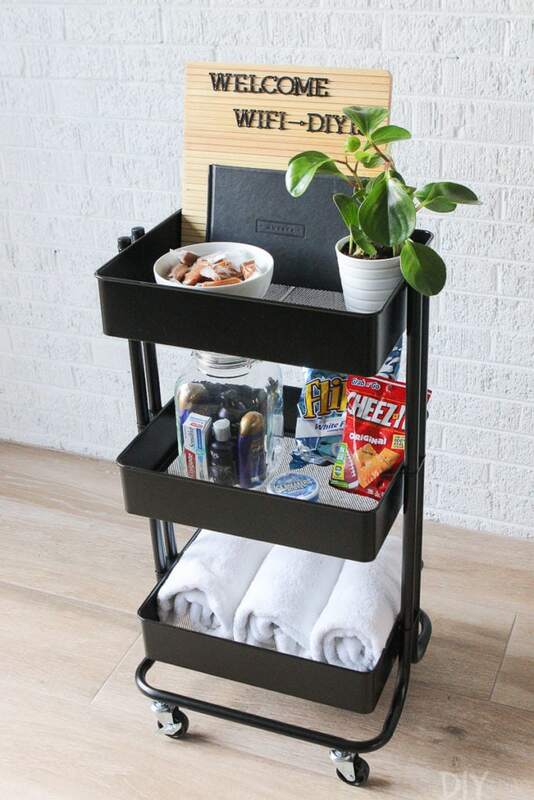 This one might be our favorite use of the rolling cart. We styled it for a guest room and on it added everything your guests might need for a comfortable stay. 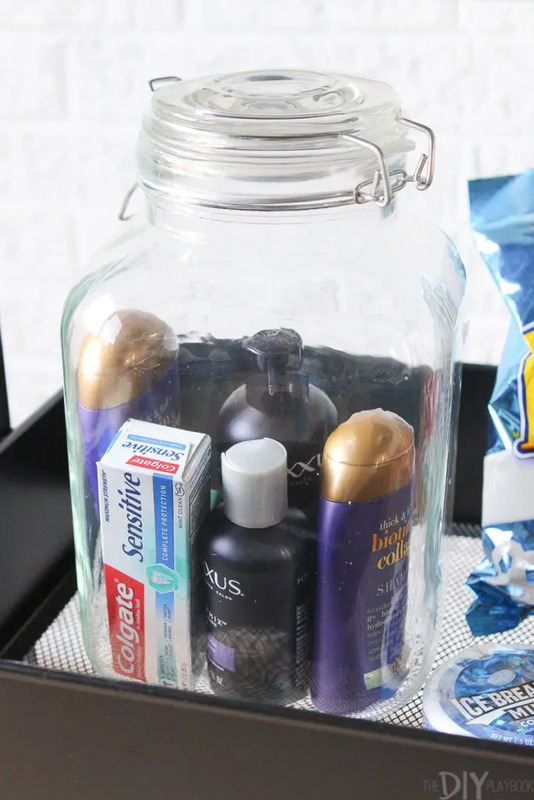 A large jar holds small toiletries, in case your guests forget anything for their trip. We also added some snacks, to avoid any hangry moments (and you better believe we ate all of these snacks the moment this photo shoot was over). 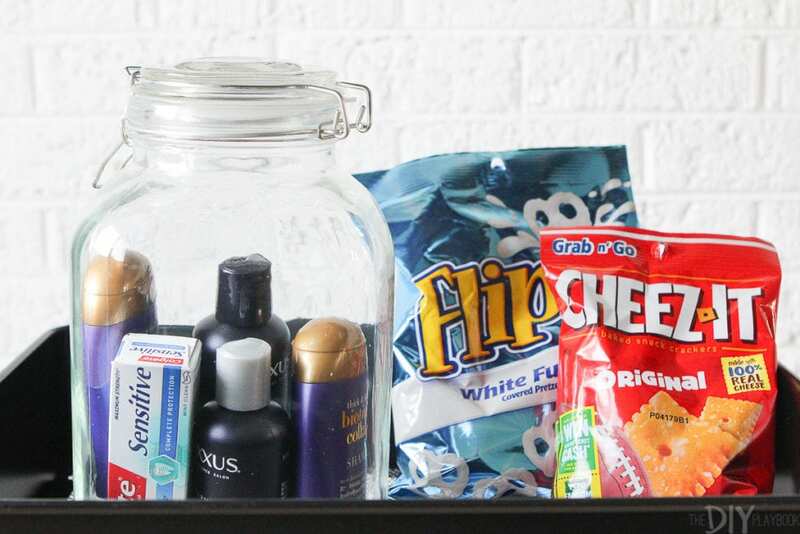 You can also add bottled water, gum, or even local goodies to make your guests feel right at home. 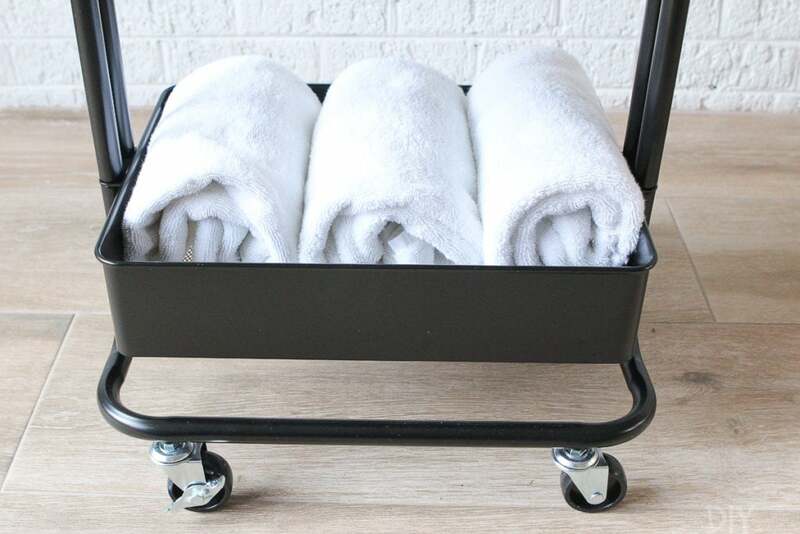 On the bottom of the cart, we added extra towels (because you can never have too many plush white towels!) to make it feel extra luxurious. 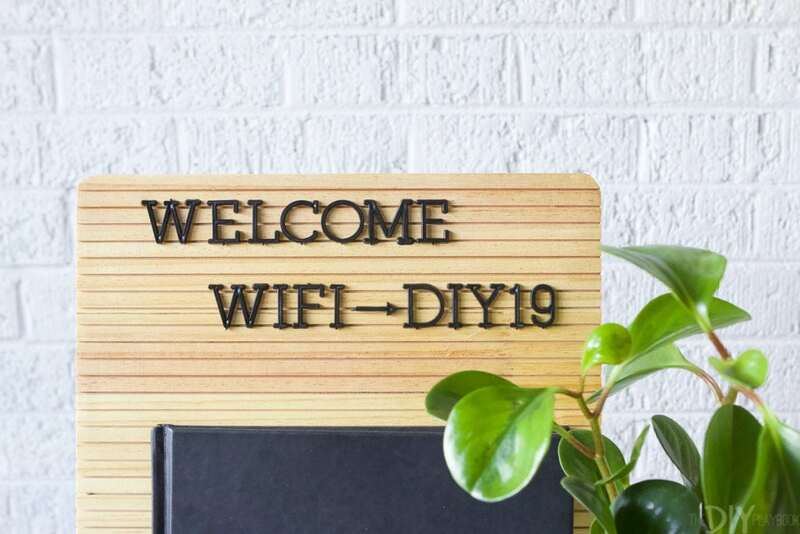 Up top, we added this wood letterboard from Michaels, along with the home’s wifi password. 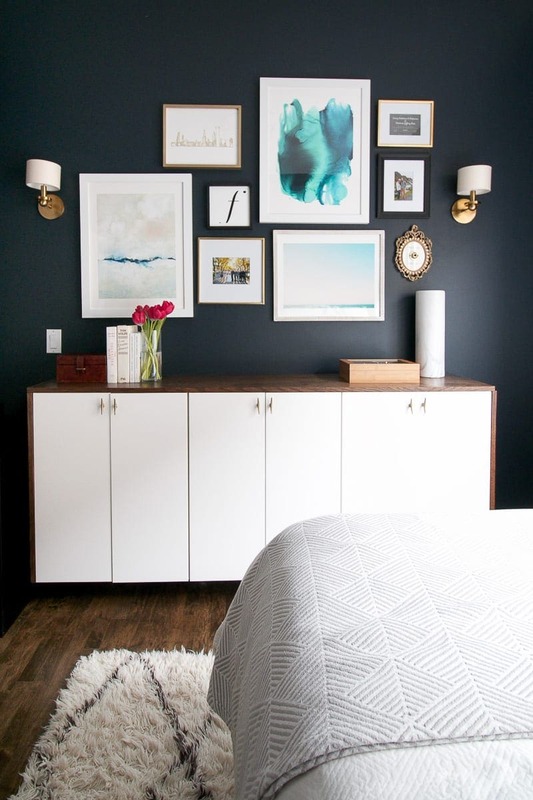 Such a good idea for any guest room! 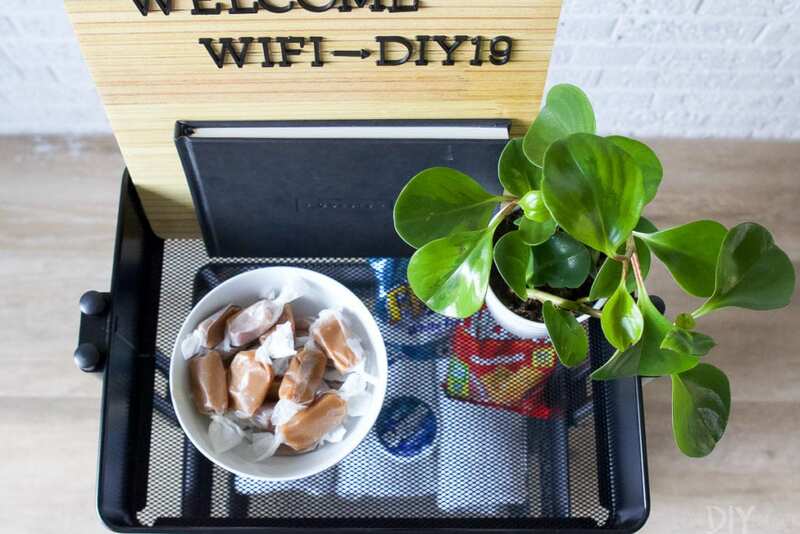 A guest book (Casey uses this one in her guest room), some candies, and a fresh plant complete the look on this cute little cart! If we stayed in someone’s home and they had this assortment waiting for us, we’d instantly feel right at home! Now we’d love to know, which rolling cart look is your favorite? 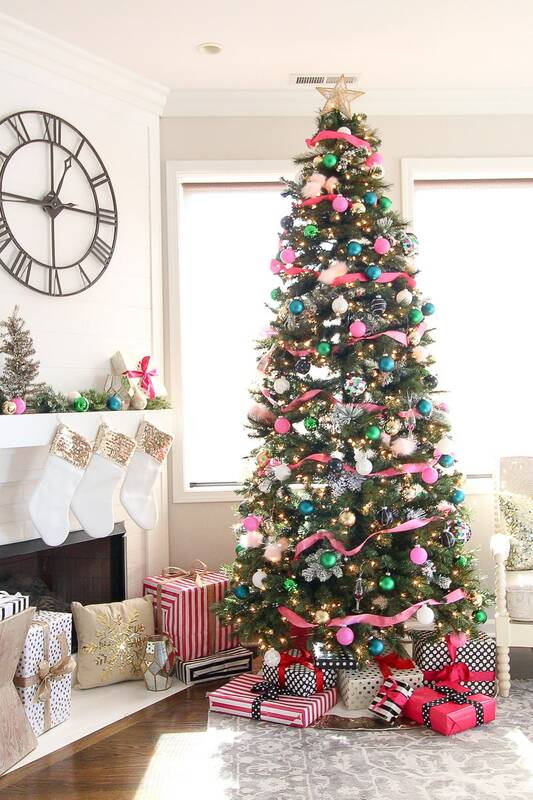 We think they’re all pretty handy for any home.